As professional veterinarians at West Ballantyne Animal Hospital, you can bet that we’ve dealt with more dogs in our years of being operational than we can even count. We love every single dog that we treat, but tragically, sometimes dogs end up coming in because of myths and falsehoods that are believed by their owners. There’s a reason why — dogs put so much junk into their mouths that the prospect of their mouths being cleaner than ours seems unbelievable. Well, whoops, turns out it is too good to be true. Dogs explore their entire world with their mouths, don’t brush their teeth, and many of them eat their own poop. 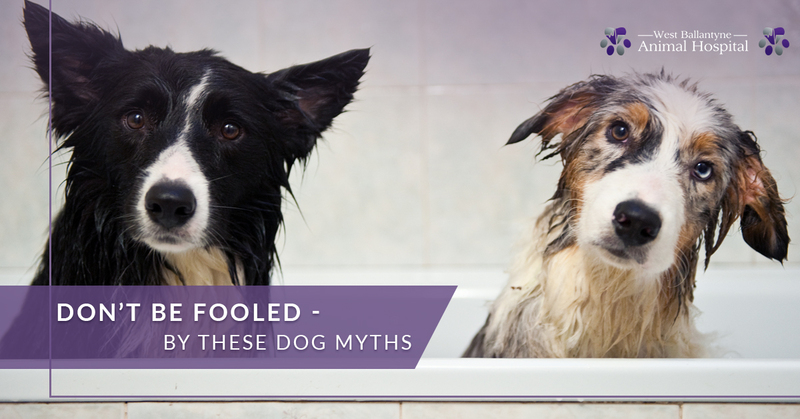 The reason why this myth can be dangerous is that it causes a lot of owners to neglect their dog’s dental health. This is an important thing to keep in mind. If you brush your dog’s teeth, they’ll be thanking you later in their lives. Don’t do this! We are, of course, talking about excessively hot weather, where dogs really suffer. The truth is that nobody should ever be left in a hot car that’s not running AC, even if the window is letting some fresh air in. Not a baby, not an adult, and especially not a dog. While humans are capable of withstanding the excessive heat in a car (with open windows), we have an important thing that other animals don’t — sweat. Sweat is the human body’s go-to method of cooling itself. Other animals not only sweat, they’re all the more hot because they have entire coats of fur. A dog in a car literally has no way to cool itself down, and if it’s hot enough, mere minutes being left alone can cause dangerous health problems. Yes, dog’s noses are generally wet and cold. Yes, it’s usually a sign of concern if a dog’s nose is constantly dry, warm, or cracking at all times. No, it’s probably not an issue if your dog’s nose is randomly warm and dry from time to time. There are a huge variety of factors that can affect the moisture of your dog’s nose, and if your dog has an underlying condition that’s causing their nose to run dry, you’ll probably be able to tell. If it’s just a random thing, keep an eye on it, and it will most likely be back to normal in a short amount of time. This is knowledge that can save you from an unnecessary vet trip. One myth with all pets, no matter the type, is that vet clinic visits are only necessary when the animal is showing symptoms. In fact, having regular checkups can actually help to nip a lot of issues in the bud before they become proper problems. There’s a lot that can go on behind the scenes with your dogs, and it’s important to get ahead of them. Need to take your dog to the vet? Stop by West Ballantyne Animal Hospital in Charlotte, or contact us today!